If you’re a contract digitizer you’ll find you deal with all the different sectors of the textile industry at once. 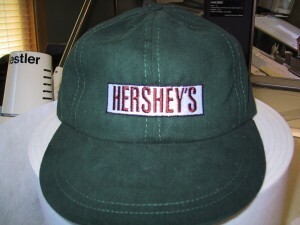 These range from promotional marketing companies, apparel and headwear manufacturers, contract embroiderers and people in the retail market, such as sporting good stores. You feel like your always under and microscope and you never know whether your reward for a design will be praise or criticism. You might as well be clairvoyant, while constantly adjusting yourself to the type of customer your currently doing the job for. Some want quality, rich in appearance and on the higher of the density scale, while others are only price conscience because that’s the way they operate their business. Then you can get either end of the scale getting overly cut throat because many companies may be bidding for the same job. As always, the best way to keep a happy customer is to get to know their specific needs. This can get confusing when your customer base grows into the hundreds, so right at the beginning start documenting or categorizing you customers, I’ll leave it to your discretion as to what names you wish to give them. At the beginning stages of getting to know your customer let them know that “special requests” must be addressed at the time the order is being placed. 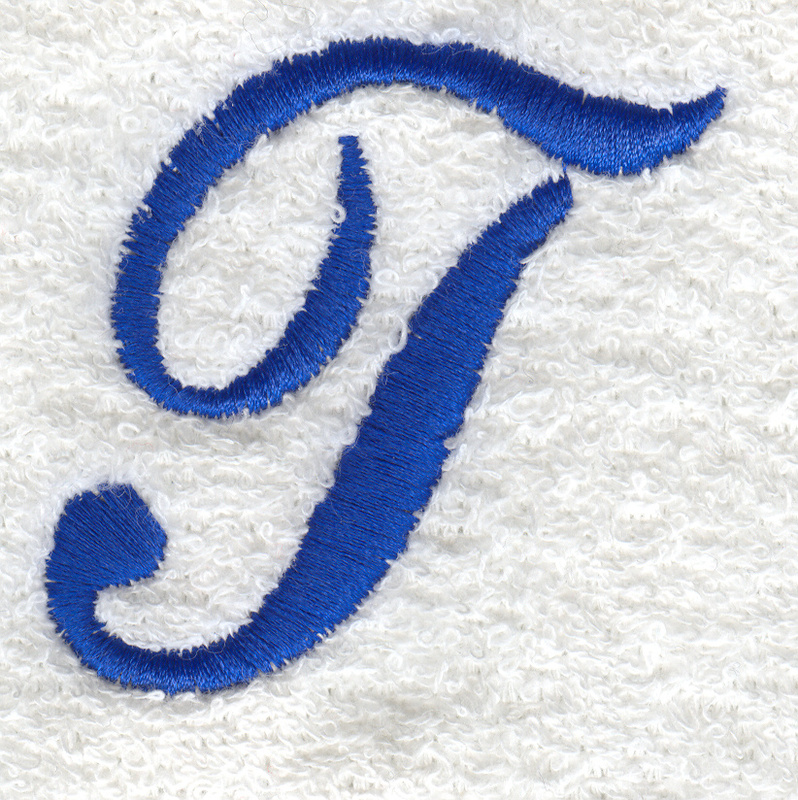 “Special request” can fall into many categories; terrycloth, polar fleece, foam embroidery, leather and the list goes on. If they do not identify the “special request” then be sure to charge them for any edits that need to be done after the fact, time is money after all! 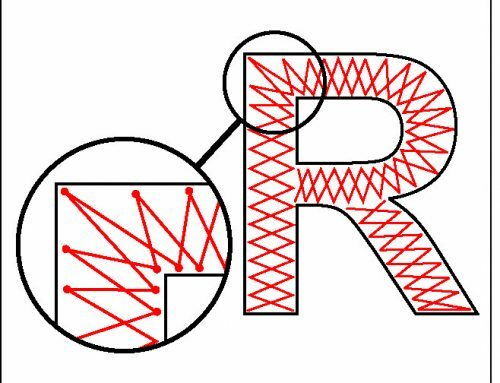 There are many ways to cut down the stitch count of a design depending on the customers flexibility of graphic options, stitch types, densities, application and how much they are willing to bend to achieve their objective. 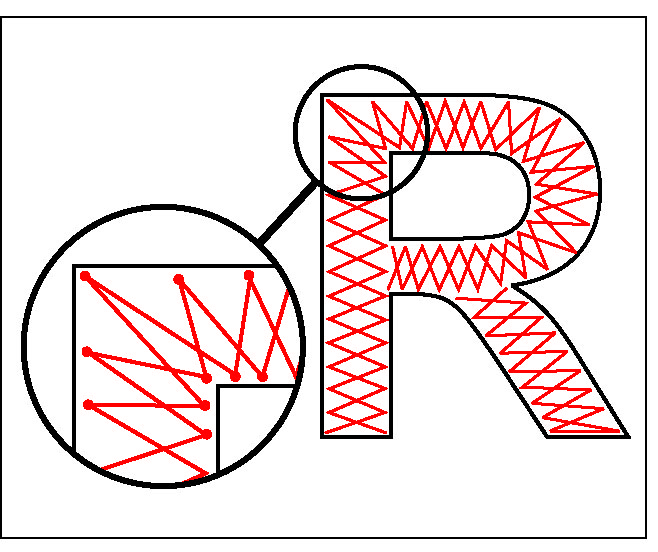 We have all had that customer who gives you a design, that if you digitize it properly it would have 10,000 stitches. However they are insistent that it only has 5,000 stitches. You see that’s all they’ve budgeted for, but they still want top-notch quality! Sound familiar? 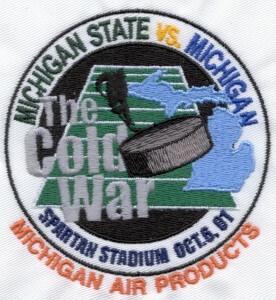 In that situation I’ll tell the customer, “Let me digitize it properly so you know how it should look, then I’ll give you a second file processed by the software at your desired stitch count. When your customer says it looks like crap, use the first file I sent you.” The point is we need to be realistic! If you take away too many stitches it will inevitably affect the appearance of your design. Here are a few suggestions that can help in trying to keep the stitch count down in those awkward situations. Our first option is to play with the stitch lengths and values of underlay and running stitches. You can then adjust the density values of column stitches as well as densities and stitch lengths of fill areas. The trick is to play with values enough to make a difference in the stitch count without dramatically affecting the visual integrity of the design. Here is a before and after example of how this can effect the stitch count without drastically effecting run ability and visual appeal of the design. The original file has, 23773 stitches (fig. 1), the edited file 19966 stitches a savings of 3807 stitches (fig. 2). If you are a contract embroiderer with 200 pieces to embroider, it equates to over 781400 stitches of saved running time. Well worth spending 15 minutes editing and a couple of sew outs! 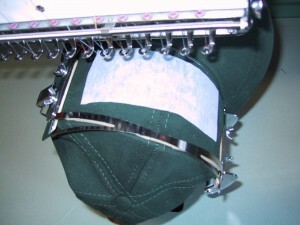 In some situations you can further reduce the stitch counts by converting some of your fill-stitched objects into satin stitches. Sometimes this can be a little misleading because if the stitch length of the column is to long, the machines speed will automatically slow down and you won’t really save much time at the production level. 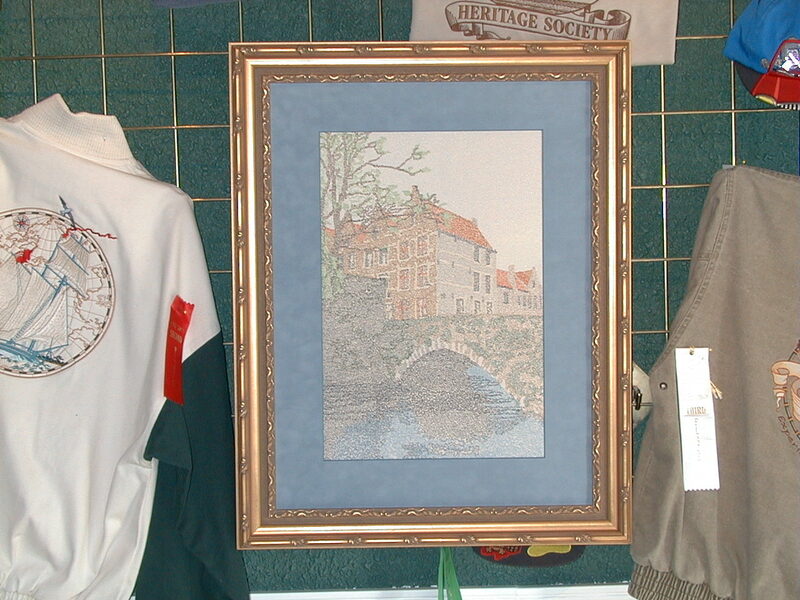 Secondly you can work on altering the customer’s artwork somewhat to try and meet the desired stitch count. 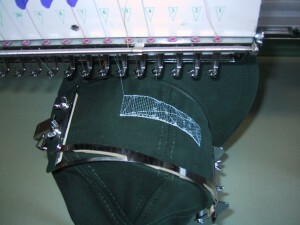 However, these changes usually affect the quality of what one might consider good embroidery. Some of these changes might include not putting borders around fill areas, using walking stitches instead of column borders around objects and simplifying or deleting details of the customers’ art. These types of changes don’t usually go over as well so get any changes approved and in writing. The above is one of those you get what you pay for situations. My last suggestion is one that directly involves production more than it does the digitizer. Usually when your on the floor and bring up the word appliqué, you get an immediate cold response. And rightly so, the traditional appliqué process has a lot of cutting out, lining up and excessive down time on the machine. Being lucky enough to have run production and being a digitizer at the same time. I was able to play around with using unorthodox appliqué methods when I felt I could get away with it. 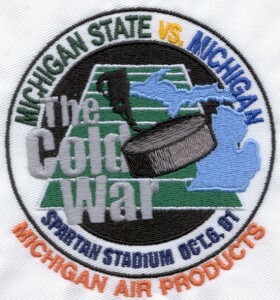 What we did was pretty simple, we would use certain materials (colored plastics, tear-away pelons) as a base on which we would digitize and stitch a very loose fill. The trick is that you run your underlay stitches for the area first and then program a stop (fig. 3). Lay down your material with little regard to placement (fig. 4) and then stitch the loose fill area. 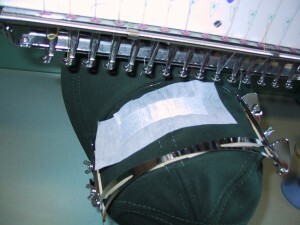 Immediately after stitching the fill area program a run stitch with a slightly closer length value to help perforate the edge (fig. 5). before embroidering the column edge around the fill (fig. 7). 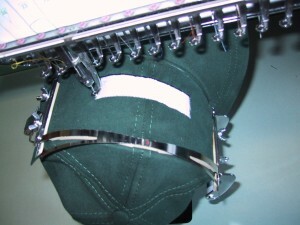 In some instances you can even wait until the cap comes off the machine and tear the pelon off at the finishing stages. This is the original design at a stitch count of 7812 (fig. 8). The edited file (fig. 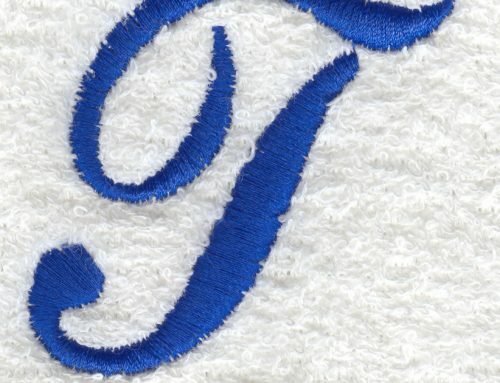 9) has 6531 stitches with a savings of 1281 stitches with little or no visual effect. This isn’t a difficult process and can be executed quickly at the production level. There are a few criteria in determining whether the job in question is a good candidate for this technique; is there a large enough filled area to make it worth while? 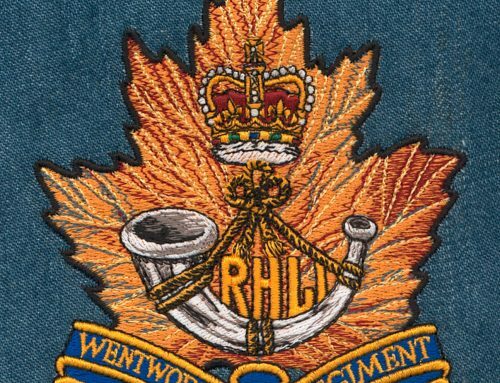 Does the quantity of the order merit the specific programming and are the goods being embroidered friendly for the type of application given the appliqué materials being used? 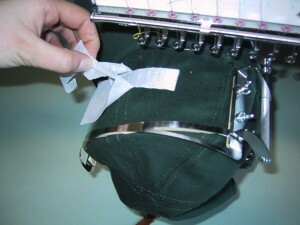 We used this technique often on goods that you wouldn’t be washed after every use, such as jackets and caps. If you spend the time and source the appropriate materials it can also be successful with your washable items, it’s just a matter of taking the time to experiment. Thank you for the article John. I think about digitizing for others and have no idea where to start or what to do…for now I will keep thinking LOL LOL and when my skills become better I will think about it again…and return to your tips. Hi John, I am wondering if you could clear up some confusion about the pic in Fig. 3. 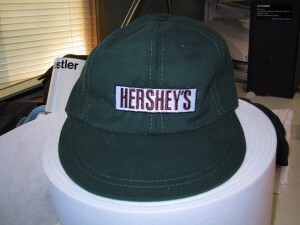 Are you laying down the underlay stitching directly on the hat or is there a stabilizer underneath there. Also what is the purpose of doing so? Is that to give the base stabilty? Could you not hoop your pellon/stabilzer and embroider? The underlay is to provide stability and laying the tearaway stabilizer then just assists with the white thread not showing the darker fabric showing through. In theory it could be done multiple ways, if I remember correctly that order was done on hats and garments on different colors. On the lighter colored fabrics it wouldn’t be necessary. The goal to to make sure the white fill loose solid without adding density to the design. Hope that clears it up!